VXX: The only product guaranteed to hit $0. Now, I say “almost 0 risk” because the only real risk you have is to get margin called if VXX pops up too much. Therefore, keep a small shorting position and remain miles away from a margin call and you literally cannot lose money on the long term. First, what is VXX? It’s a strange product that very frankly should not exist at all. The VXX is an ETN (exchange-traded note) that seeks to provide exposure to the VIX. In other words, it wants to rise when the VIX rises and it wants to fall when the VIX falls. That’s what it says it is. Yet, there is a massive problem at the very first step of how it was designed. Here is, in simple terms, how VXX works. First, let me define what the VIX is. The VIX measures the implied volatility, on an annualized basis, of the S&P500 over the coming 30 days. It uses a rather complicated string of options on the S&P500 index and, using a stastical approximation, seeks to replicate the implied volatility of those options­. Volatility is basically how much traders expect the market to move. The more pronounced the moves are expected to be, the higher the implied volatility. Thus, when the S&P500 is expected to move a lot (either up or down), the volatility rises. 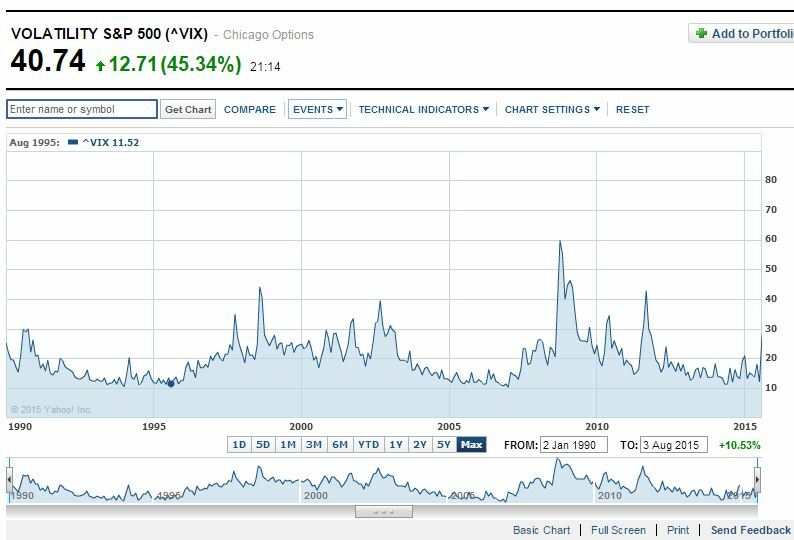 Traders like to look at the past to predict the future; thus, if the S&P500 has just crashed, the VIX will rise. This methodology has its weakness and its strengths, but that’s how it works. Fun fact about the VIX: it should “spike up” when the market rises by a large number, yet it almost solely spikes up when the market crashes. Overall, the VIX has become a measure to protect oneself against crashes. It should be obvious to the reader by now that you cannot hold the VIX like you hold a stock; because options expire, the VIX needs to “renew” itself. Under Black-Scholes, which is overwhelmingly used to price stocks, volatility is presumed not to be affected by time, i.e. the expected volatility for the next ten years is the same as the volatility expected for tomorrow (on an annualized basis, of course). The volatility does vary, but, according the Black-Scholes, has a “flat” effect; in the model, it is used as a constant, not a stochastic process. Thus, the VIX trades as futures, on a weekly basis. In other words, you can buy a contract for the VIX that ends at every week. Protecting yourself against a rise in volatility is thus quite hard as you need to roll your futures, i.e. sell expiring futures and buy new ones that expire later. We are at the end of the first week of January. VXX puts 50% of its money in the VIX contract ending in the first week February and 50% of its money in the VIX expiring in the first week of March. Sounds complicated? It’s basically a way of attempting to provide constant exposure to the underlying, the VIX. Yet, there is a massive problem with that methodology and we’ll get to it shortly. Even though the VIX is up 100% in the last six months, the VXX is down nearly 25%. And it’s not like I picked a special period either: we can see the gap widening over time. Because the VXX, in the very way it was conceived, is a broken product that basically will always fall over the long term, no matter what. It’s an anomaly that simply should not exist and that slowly leaks money over time. It is thus guaranteed that VXX, one day, will hit $0. Every single time it spikes, it eventually comes right back down. Keep in mind that the VIX is NOT like a stock. Most stocks do not have mean-regression characteristic and can pretty much keep rising again and again (or crashing over and over, down to $0). VIX, however, tracks the implied volatility in the S&P500; the higher the implied volatility, the higher the VIX will be. The VIX pretty much corresponds to the expected move of the S&P 500 over the next month, on an annualized basis. In 2009, when the VIX was at 2009, people thus expected stocks to move by roughly 60% in the coming year (Note: this isn’t entirely accurate due costs/finance/the mu factor of the stochastic process, but it is a good rule of thumb). An astute reader should immediately note that the “direction” of the move doesn’t matter: a big rise or a strong crash will both, in theory, have the same effect on the VIX. Yet, the VIX is mostly used by traders as a measure to get protection against crashes (it spikes when the market crashes). I’ve found the VIX to be a notoriously poor tracker of big market rises. Based on those elements, the VIX will always fall back to its mean (which, again, is unknown, but most likely somewhere around 10-20) Sure, it can take a long time going down, years perhaps, but it always will. Based on that, in order for sigma to remain elevated, the market would have to move up and down very quickly, forever. Think, +10%, -10%, +10%, -10%, etc. This doesn’t happen and it cannot happen neither; while there are some turbulence periods, the S&P500 is not quite volatile over an extended period. Eventually, stock reach their “real prices,” or perhaps it should be more accurate to say that, eventually, the pressure from the sellers is the same as the pressure from the buyer. It would go against all financial theorem and all pricing models for a market to remain this volatile forever. Remember that the market is based on the general economy and the economy does not go up and down by a wide margin every day forever. The economy moves slowly and, eventually, an equilibrium is reached on the stock market (after all, can you think of an economy that goes up and down 10% every day forever?). An astute reader might mention a stock market that would crash 10% per day, forever, which would again, imply, a lasting high volatility (or the opposite, a market forever rising). Again, this is not possible. No matter what your view on stocks is, stocks are worth “something.” For instance, Apple has $30 per share in cash and it would be very hard for someone to argue Apple is worth less than $30 per share at the bare minimum. A very trollish reader might mention the possibility of a global market meltdown that lasts forever, but if society does collapse, the stock market is the last thing you’ll care about, believe me. Since there is a mean reversion, it means the VIX will eventually fall back below 20, near its mean. Thus, VXX, over a long enough period of time, will always track an element that never rises. 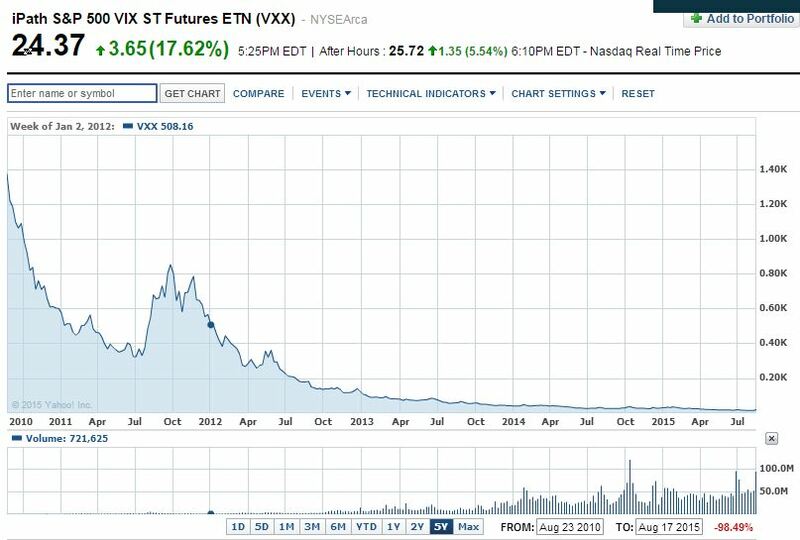 The VXX can never rise forever, or even for an extended period of time, it HAS to go back down eventually. At best, a perfect VIX tracker could hope to remain near $15 forever, but this is not possible for a few reasons we will see later. To simplify further, imagine buying a fund that tracks an index that always, sooner or later, goes back to its value of 100. Your fund would lose you money over the long term with 100% probability. While not huge, the 0.89% annual fees do cause the VXX to “leak” some of its value over time. Let’s say VIX stayed at $15 forever, and let’s say VXX had no time decay: you would lose 0.89% per year every year, forever, with a 100% certainty. Why is that? 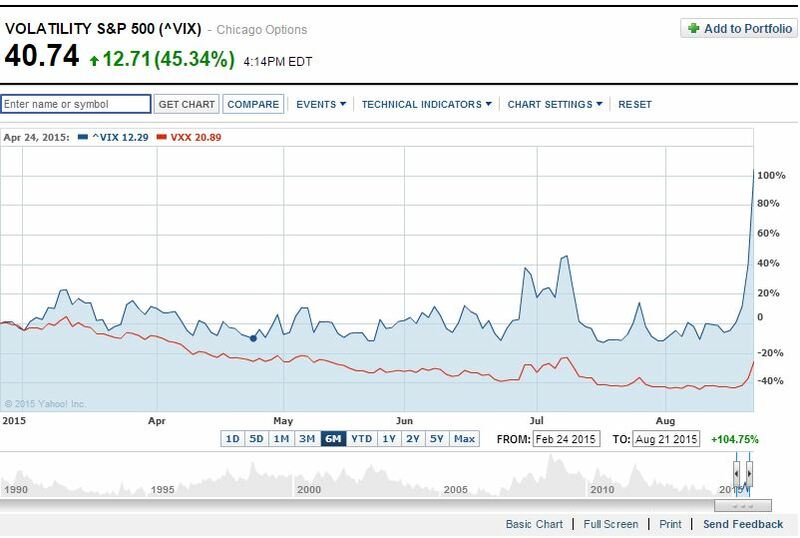 Why did the VXX crash 77.62% on a year the VIX crashed only 20.06%? Because of time decay. Because of how terribly designed the VXX is. People have often speculated he drop in VXX was due to contango. However, this is incorrect. Let me explain first what contango is. Contango happens when the prices further away in time are higher than the current prices today by a margin higher than what theory would predict. First, let’s define a future. Futures have a price. For instance, the futures price of oil for October is $38.84 for 1,000 barrels. Thus, if you sell a future, you get $38,840 today, but you have to deliver 1,000 barrels on October 2015. Of course, you do not really have to deliver the barrel since this is all virtual, but you would still have to buy oil at the spot price at that time. If oil is at $35 per barrel in October 2015, perfect! You can buy 1,000 barrels at $35,000 and you cash out the difference, $38,840-35,000=$3,840. But if oil is at $90 in October 2015, you just lost $38,840-$90,000=$51,160. Ouch. Let’s say oil sells at$10 a barrel today, and $20 tomorrow (futures price). You could simply buy the oil at $10 today, store it in your garage, and sell it tomorrow at $20. Bam! 100% profit. Now, about the scenario above (called “arbitrage”): because the VIX does not technically “exists,” you can’t do that. You cannot store the VIX in your garage. Thus, contango and backwardation can exist freely at any time and there is nothing you can do to benefit from it. VIX represents something intangible. You cannot “store” next month’s volatility.It’s a financial product based on options. Sure, there could be something to be done with options, and in fact quite a few funds do exactly that, but the liquidity of options make any possible exploitation of the mismatching of the futures curve very difficult, if not impossible. Thus, contango exists freely in the market. When people want more protection for the coming month, this month’s VIX surges. Remember that the VIX is a mean-regressive process and that people fully expect VIX to fall back eventually! People pretend the VXX falls because of the typical contango situation that is overwhelmingly present when it comes to the VIX (we are currently in a rare case of backwardation). However, this is incorrect for a few reasons. The VXX does not suffer, or at least it suffers extremely little, from the contango situation. Let me explain in layman terms. Let’s go back to our example and let’s say the VIX is in contango. Thus, as days pass, the fund has to sell the February VIX to buy the March VIX. Since the March VIX is so much higher, the fund will end up with far fewers shares of “March VIX” which, over time, according to people, will create a leaking effect for the value of VXX. In other words, say VXX= $100. It has $50 invested in each product, so 5 FEB and $3.33 MAR. After fifteen days, it liquidated half of its position in FEB to invest in MAR (let’s assume prices did not move). The fund would end up with 2.5 FEB and 5 MAR. Thus, it went from 10 contracts to just 7.5 and if this continues, the fund will end up with less and less contracts. But this idea forgets one critical element: the dollar amount remains the same. In our example, we began with a value of 5*$10+3.333*$15=$100 and we ended up with a value of 2.5*10+5*15=$75! There is no dilutive effect from the roll-over manoeuver, even in the presence of contango. The same logic applies to backwardation. Okay, so why does the product crash then? Because of how the product is structured. It’s just a terrible idea. C(T) is the present value of all costs of owning/storing/possessing/insuring the asset for T time. Say for example gold sells at $1,000 an ounce today. The risk-free rate is 2% per year. Gold costs $10 an ounce to store for a year. What should be current price of a futures for delivery a year from now? It should be 1,000*exp(-2%*1)-10=$1,010.20. That’s it. You just priced a futures. Please note that the above presumes no transaction fees, liquid market, no bid/ask spread, etc. If an ETN was started about gold, there would be no time decay. An ETN could easily buy 1,000,000 tons of gold, hold it in a vault and, apart from the management fee, it would follow the structure above. However, the VIX is based on options, NOT on an actual physical product! VXX cannot “store” the VIX. It has to keep selling and buying new contracts! Look back at the future price above. Take two expiring futures with different expiration, let’s say T1 and T2. Thus, VXX has to sell F(S,T1) to buy F(S,T2). And in fact, it does so every day, by factors we’ll call x1 and x2. Where VIX1 is the underlying of the first contract (the shorter expiry contract) and VIX2 is our second contract). The costs to hold the contract are null. The contract is an option, not a physical product, and there is no storage implied. There are transaction costs, but those are priced in the fees the fund charges, not in the structure of the rollover. And thus the fund needs to buy more x2, that is, a larger number of contracts for VIX2. But this is not possible as the second contract is more expensive; it cannot buy “more” x2 with “less” x1. If backwardation happens, then VIX1>VIX2 and, we still obtain x1, and the same element happens. The only case where VXX will not lose money would be if VIX1=VIX2(exp(-r(T2-T1)), or if weight could be adjusted not to have the product sum to zero. This is clearly not possible, and thus there is a decay in place. TLDR: VXX drops by a tiny fraction every day no matter what and always will. If you are curious by how much, someone has computed a figure of 1.8% per week. You are seeing right. VXX used to trade at 1,400 (it did reverse splits to consolidate its price). Today, it trades at $24.37. On December 2015, it will most likely do another 4:1 reserve split and the price will be around $100. Then, it will fall back to $24 again. Rinse and repeat. You cannot lose money on the long term by shorting VXX. But if it’s free money, why doesn’t even do it? 2) Many funds are restricted and cannot short anything at all. 3) Although you WILL make money eventually, the road there is long. The VXX might spike to $40 tomorrow. Almost no fund will want that kind of risk in their portfolios. 4) VXX doesn’t scale well in a portfolio, it makes the portfolio extremely risky and fund managers don’t like that. 5) There is no guarantee this strategy will outperform the index in the future. In a way, you are betting that the market will not do “too well” as a soaring market will also cause the VXX to spike up. 6) The volatlity is extreme.Today, it spiked 16.72%. Not many people can tolerate that kind of risk. 7) There is a strong margin call risk!!! 9) The VXX is too complicated for most people. Remember that although it tracks the VIX poorly over the long term, the VXX does just fine on the short term. If the VIX spikes, the VXX will spike as well. There is nothing that prevents the VXX from jumping 100% overnight. But again, the VXX WILL reach $0 eventually. Why will it reach $0? It won’t, due to the expiry in 2019 AND due to the fact it sells new note every year (and some people actually buy them). Still, even with expiry, it will most likely hit $0.50 or something silly like that. With a 1.8% leak per day (again, I did not calculate this value and another author had a 10% leak per week)), this roughly translates to a 70% drop per year. Sure, there’s the spike when the VIX does spike, but the “leaking” effect is present no matter what happens to the VIX. Every day, everyone who holds that garbage loses a little bit of money no matter what happens! Imagine someone swimming against a strong current. Sure, sometimes, he can catch up, but eventually, he current will flood him away. In the case of VXX, it will keep slowly dripping away until its maturity. Unless the VIX goes to 80 and stays there for four and a half year, you will make a killing shorting this stock. And even if the VIX goes to 80 and stays there for three and a half year, you will make some money (even if the VXX reaches $60, calculate its worth after dropping 70% per year for 3.5 years). Had there not been an expiry date, the product would have kept crashing and crashing, raising money every year when it does a reserve split and giving you insane returns forever. Shorting VXX, apart from the possibility of a margin call, is pretty much like printing money! So, should I short VXX? Absolutely. It’s basically free money. Keep in mind, however, that it can rise, and that it can keep rising for a long time. With around 3 years and a half left on it, most of the profits that had to be made has already been taken; however, it’s still an ultra-solid short. Do not push the liquidation date (or do actually push it as the fund is leaking out money every month) and this is a pretty safe short. The simple fact that this product is allowed to exist is an aberration. The fact that people buy it shows that there is no limit to how stupid and lazy people can be. If you want to go long on volatility fo rthe S&P500, buy VIX futures. If you do not know how to buy futures, you should not play the volatility. But but but market crash! There’s another element to consider. Let’s say the stock market does crash. The market crashes to 1,500 or so. Then the market stays there. Oh, the index goes up a percent or two, it goes down another percent or two, but a year later, the market is still at 1,500. That’s right. The precious VIX falls down. Why? Because the VIX is the measure of the IMPLIED volatility of the next 30 days, NOT the measure of PAST volatility. In fact, reading the white paper about the VIX, we can see exactly how it’s calculated: it depends on the values of options on the index. Therefore, it depends on how much the market anticipates the S&P500 will move. It is, thus, entirely dependant on the buy & ask spread, as well as the Black-Scholes model (which is how options are priced) and most people used Black-Scholes tend to look at historical volatility. Thus, if the market is idle, the historical volatility drops and the VIX ends up dropping. It doesn’t matter if there is a market crash or not: VIX will eventually go back to its mean and VXX, being an absolute joke of a product, will fall.